"Print and Painting of the Aonach Eagach Ridge, Glencoe, Scotland, by Neil J Barlow"
Viewed from near the summit of Meall Dearg this painting shows the pinnacled crest of the Aonach Eagach Ridge known as "The Chancellor" with the summits of Stob Coire Leith and Sgorr nam Fiannaidh in the background in fine winter conditions. Beneath the cloud, in Glencoe, there was no hint of this magnificent view. 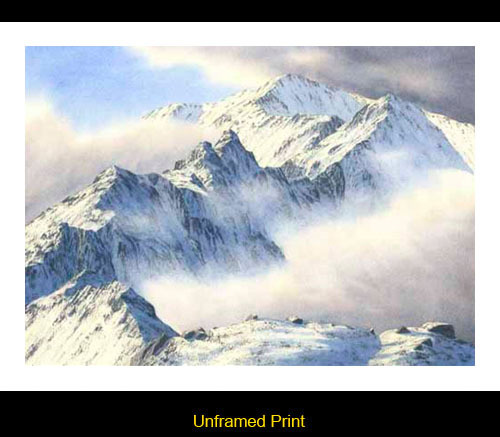 Limited Edition Giclee Print from an original watercolour painting by Neil J Barlow. Move your mouse over the thumbnails below to view the framing options.